with recent cinema and tv iterations of Superman and his universe. When I was a kid, Superman was always super. He didn't discharge like a two-year old cell phone with a non-removable battery if he wasn't in direct sunlight. Starting with the Lois and Clark: The New Adventures of Superman television series in the 90s, this requirement for exposure to sunlight to restore his powers has regularly resurfaced. This isn't Superman, it's Birdman. Also irksome is the invulnerability business. The Superman of the 50s, 60s, and 70s had just two weaknesses- kryptonite and magic, whatever the hell the latter is. That version of Superman could survive a nuclear explosion or fly into the center of the sun without being injured. He did get short-term amnesia in the classic Adventures of Superman episode "Panic in the Sky1" (season 2, episode 12, first aired in 1953) when he collided with an asteroid, but we never saw Supe bruised or bleeding. In recent films, Superman has been almost mortally wounded when stabbed with weapons composed of kryptonite. While kryptonite indeed weakens him, it isn't capable of puncturing his skin. In the classic "Defeat of Superman" (season 2, episode 6, aired in 1953), he was shot with a kryptonite bullet. While it caused him discomfort ("Just a bee sting, Jimmy") it still bounced off. Then there's Superman killing Zod by breaking his neck in Man of Steel. Nope. Invulnerable means invulnerable. Regardless of the amount of force applied, the villain's neck should not have been able to be injured regardless of its source- not even by another super-powered Kryptonian. 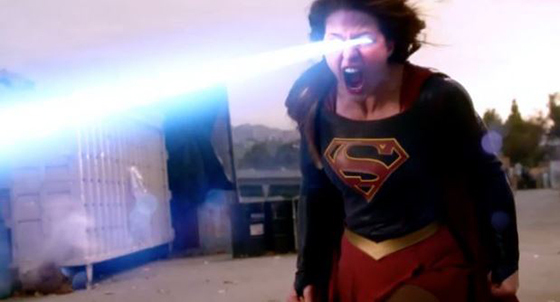 And the new CBS Supergirl series is a hot, steaming mess full of stuff like this. Sun drainage issues, lots of sharp kryptonite injuries and, frankly, too damned many Kryptonians. I won't burden you with the details, but Supergirl and her cousin are not the touching sole survirors from a doomed planet, but a pair of goody two-shoes who instant message and text each other while battling an NFL-sized contingent of metahuman sociopathic relatives. Canonical issues aside, the show also suffers from uneven writing and muddled plots, and from time to time seems to shoot itself in its non-super foot while limping through its Kryptonian mythos arc. Oh well. I've been a fan of Superman since the 1950s, and I'll probably continue to watch any Superman-related stuff that becomes available. But the apparent appearance of the Doomsday character in the Batman v. Superman trailers makes me think things are going to get uncomfortable. 1 "Panic in the Sky" was the story upon which the Lois and Clark episode "All Shook Up" (season 1, episode 12) was based. The writer of the original show, Jackson Gillis, was given a "story by" credit. Gillis had an impressive, four decade long career that including innumerable scripts for The Adventures of Superman, Perry Mason, Lassie, Lost in Space, Hawaii Five-O, Columbo, and Knight Rider. Gillis had written a motion picture script "Superman and the Secret Planet" which was never produced.